Doritos and Pepsi, Freshwater, Giffords, ID, commies, resolutions, chupacabra and more! Doritos and Pepsi: the flesh and blood of Christ - Jesus never tasted better! Freshwater recommended for termination - Buh-bye, now. Editor’s Choice: An intro to Intelligent Design for skeptics - The IDiocy continues. More resolution than the Hubble? - Tell us about your resolution. The Cryptid Zoo: A Menagerie of Cryptozoology — Bigfoot stories won’t go away. Sightings of Chupacabra are not as rare as they probably should be. Expeditions to Lock Ness in search of Nessie still happen. And what the hell is a Mirapinna? Put together by Jamie Hall, who also wrote a great introduction to the site, The Cryptid Zoo has them all! From A to Z, just about every fantastic animal (that doesn’t actually exist) is not only listed on the site but also described with citations and including sources for more information about each animal. In short, if mythic beasts, monsters or creatures that have been described, but as of yet, have not actually been found in nature fascinates you, this is your kind of site. The The Cryptid Zoo itself is broken down into three sections. 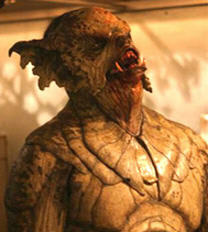 They are Humanoids, Draconic and Animals. Those sections are further divided into subsections that include all the creatures on the A to Z list, below the main three sections. So there are two ways to explore the information on the site. You can do it by section or by using the alphabetical list of creatures. That makes the site great for some cryptozoological surfing or for looking up a specific creature. I didn’t know anything about Globsters. I didn’t know they had a name. But now I do! Wednesday: Chat started with a new guy from Florida, close for trips to Kennedy Space Center, and Dragon*Con “up north”… We spent time sighing over people with fantasy-filtered world-views, and while doing that a friend of Ky came over to say ‘Hi’ then disappeared. Ky wants a tatoo with the sun and physics formula in it. Old actors have done unexpected things in their youths, and lots of puns pulled out of a visit to the dentist. After that, politics and economy. The chat ended with Dr. Mabuse leaving to get home from work, while Kil and the rest stayed and solved the world’s problems. Judging Edward Teller: A Closer Look at One of the Most Influential Scientists of the Twentieth Century, by Istvan Hargittai. “Many people know Edward Teller as the ‘Father of the H-Bomb.’ His name tends to generate extreme views. To his supporters he was a hero of the Cold War. To his detractors he was evil personified. Between these extremes was the life of the real man. In this definitive and comprehensive biography, Hungarian scientist Istvan Hargittai, a personal acquaintance of Teller’s, presents a balanced portrait of the multifaceted and enigmatic scientist against the backdrop of a turbulent period of history. Taking pains to avoid bias and preconceptions, Hargittai critically examines Teller’s personality, family background, and the experiences that guided his actions — correcting many of the myths that others and Teller himself promulgated. There were 8,051 daily visitors this week.